The Dustbowl Revival's much awaited second LP merges their own raucous brand of bluegrass, gospel, jug-band, blues and the hot swing of the 1930’s. Featuring a collective of over ten musicians, this spicy roots cocktail will get you moving in no time. The Dustbowl Revival is a Venice, CA-based folk orchestra. Known for their rollicking dance-inducing live sets, the Dustbowl Revival plays what some call hillbilly jazz—the original front porch rock n’ roll. Think Dylan The Band in Newport meets Louis Armstrong in New Orleans meets Edward Sharpe and The Magnetic Zeroes on the beaches of LA. It’s young people playing high-energy, vintage music and it’s all written and composed by howlin’ and stompin’ 24 year old frontman Zach Lupetin who first envisioned putting together a kind of roots supergroup when he moved from Chicago (his father is a blues harp virtuoso who sometimes sits in), to Michigan and then to sunny Los Angeles three years ago. Growing from a small string band diligently playing local Southern California clubs (over ninety shows in the last two years), DBR is now a collective of over ten musicians with instrumentation that often includes tuba, trombone, clarinet, cornet, trumpet, mandolin, banjo, drums, guitars, double bass, harmonica and plenty of washboard and kazoo for good luck. The band’s spontaneous, participatory set-lists assure that every show is a little bit different. With an enthusiastic and growing following, The Dustbowl Revival now prepares to tour the west and is very proud to present “You Can’t Go Back To The Garden of Eden”, their first record featuring the whole Dustbowl "family" in one place. Merging their rootsy vintage style with a hip, lose-your-troubles-and-start-moving vibe that rings especially true for these times, the record enthusiastically represents the band’s upbeat message. 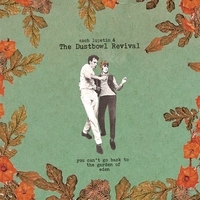 "The Dustbowl Revival doesn’t exactly follow the fickle path of fashion. And that’s fine by us, because from the band’s sophomore album is a sweet-hearted "Dylanesque" ride...that ends with a whistle." This CD is just: "GREAT". Few, if any, CD's have gotten the endless loop treatment in my car for so long. Musically rich, unique, and thoroughly enjoyable. Thanks!